Did you know you can check your balance online or by text? What is an Engage Card? It is a prepaid Visa Debit card. You pay money onto the card by standing order via Riverside Credit Union and then you can shop, pay bills and save money with a cash-back reward programme. You decide how much you pay onto the card, so it can help you budget and there is no danger of overdrawing the account. You can only spend what you have paid in. The important thing to remember is that the Engage prepaid card has no overdraft facility – so no spiralling debts from overspending. What does the Engage programme mean for members? 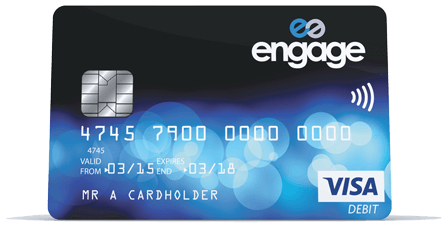 The Engage Card lets members benefit from cash-back rewards at stores like Asda, Argos and Toys R Us, plus utilities, mobile/broadband contracts and insurance products. Each time you spend with a store that is part of the Engage programme, you will receive up to 15% back. Want to take the stress and hassle out of paying your rent, mortgage, utilities, and phone bills? Your Engage account comes with a special feature that allows you to place money into “virtual Envelopes” so you don’t accidentally spend the cash you need to pay essential bills. You can set up the Envelopes, or the team at Riverside Credit Union can do it for you. Once they’re set up you don’t need to worry about them. Money will be automatically put into the envelopes when it comes into your account. Find out how we use this information.